Oh, you don’t need to wonder pal. We had a Civil War. The progressives won. 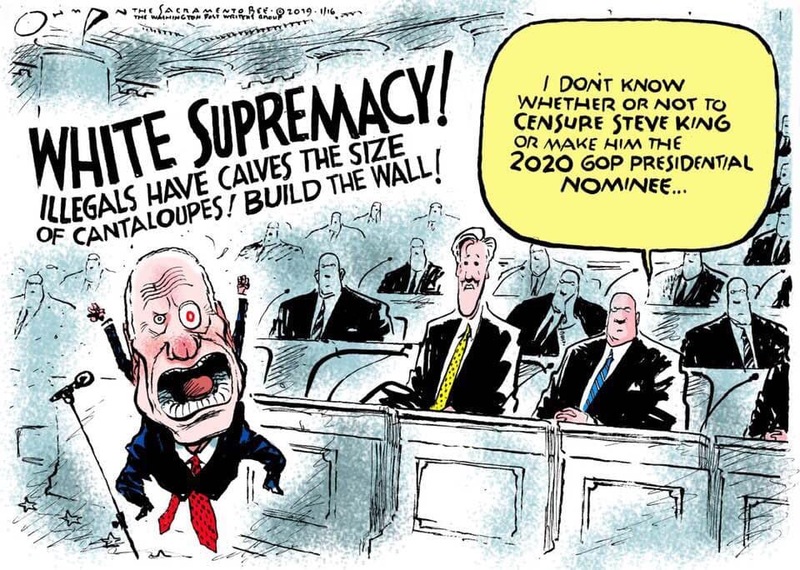 Funny how Republicans are always talking tough about the capacity for violence, but plead ignorance and scurry away when their followers act on it? The best part is that the state he represents is apparently one of the ones where people are too stupid to know which potty to use. 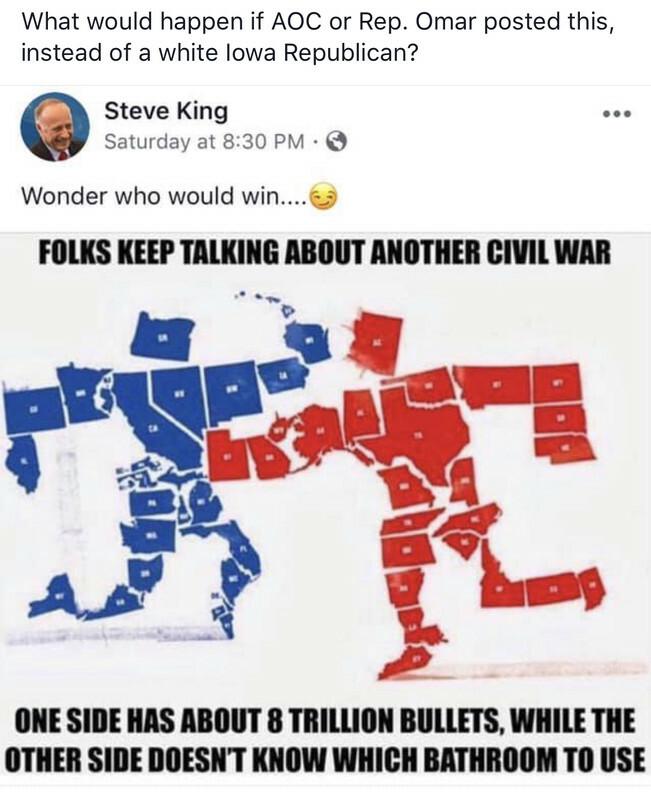 Nothing like a congressperson shitting on their own state to own the libs. This may be the best two minutes on bathroom confusion on the interwebs. Love me some Trey Crowder. This guy has too much free time on his hands since Paul Ryan kicked him off all his committee assignments. I thought McCarthy was the one that did that. Whatever….. GOP House leadership members all look alike to me. Well, ask yourself: Which side would the FBI be on? WOTD from Marc Hetherington via TPM: "Beto vs Bernie". Politics is increasingly driven, I think, by people’s general sensibilities about life rather than their specific sensibilities about politics That is source of the polarization. It comes naturally to people. They don’t so much need cues from their elites to make sense of things. It’s visceral because preferences come from an understanding of life rather than politics. And now, Micheal Bennet gets a treatment from the WAPO. Now being interviewed with daughter Caroline, 19, a Yale freshman, [who] is on spring break. They wore matching fleece Patagonia pullovers. " I went around in 2016 saying Trump couldn’t win. I was totally wrong. Then why would we listen to you Thirdwaysplaining to us about who's electable? Those Patagonias will be replaced by Carharts when they hit Iowa, or Bennet should get different staff. Well that worked out well. To put this in perspective, this is arguably 10x the value of last years entire US corn crop. Bad comparison, mike. Tariff cost is a cumulative $290 billion over ten years. Your corn crop figure is for one year. Still proves Trump is an idiot, as if further proof were necessary. So the ding to the economy is equal, every year, to the value of our nation's corn crop. TrumpHotels.Org is open for business! It's a parody site, and it is freaking awesome. Awesome is right. Nice catch, MJ.